Over 50 Epidemic Intelligence Service (EIS) officers from the Centers for Disease Control and Prevention (CDC) will be sent to West Africa to assist efforts to slow the spread of the Ebola virus. The EIS program trains doctors and other health professionals over the course of two years in skills necessary for studying infectious disease epidemics and outbreaks and officers are deployed based on their expertise and the need for their knowledge. Since the early 1950s, approximately 3,200 EIS officers have responded to requests for epidemiologic assistance within the U.S. and around the world. This Ebola outbreak is the largest in history and the first in West Africa. The CDC has already elevated its Emergency Operation Center to a Level 1, the highest level, because of the significance of the outbreak. Some of the activities EIS officers will participate in include tracking the epidemic including real-time data to improve response, improving infection control, and improving health communication. 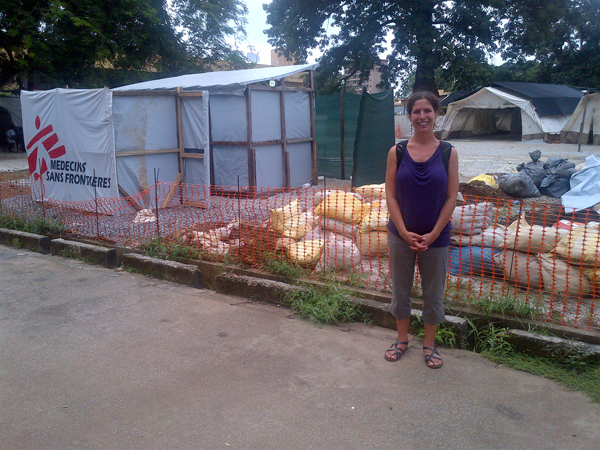 CDC Epidemic Intelligence Service Officer Kelsey Mirkovic, PhD, standing in front of an Ebola clinic in Guinea. Image courtesy of the CDC. This morning, Rebecca Merrill will be deploying from the U.S. She is one of the more than 50 disease specialists being sent to West Africa by the Centers for Disease Control and Prevention (CDC) to help slow the spread of Ebola, a virus that has claimed 961 lives so far—and nearly 300 of those were in Liberia alone.